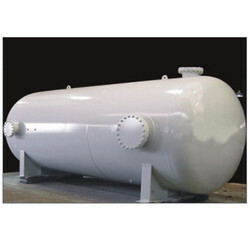 Providing you the best range of air receiver tank with effective & timely delivery. We are offering Air Receiver Tank to our clients. The receivers are available in horizontal as well as vertical installation. Standard supply is vertical installation. All following capacities have been designed at a working pressure of 10.0 bar. For other pressures and intermediate / higher capacities, please contact us. Looking for “Stainless Steel Pressure Vessel”?